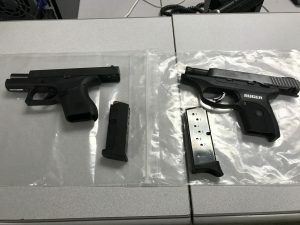 (Cheverly, MD) – A traffic stop in Prince George’s County leads to two arrests and the recovery of two loaded handguns, one of which was stolen. The accused are identified as Deandre Matthew Thomas, 21, of Brandywine and Carlson Lamont Wilson, 23, of Washington, D.C. Thomas is charged with second degree assault, possession of a regulated firearm after being a fugitive from justice, and other criminal charges. Lamont is charged with carrying and transporting a loaded handgun. Both were transported to the Department of Corrections in Hyattsville after their arrest. Shortly after 5:30 p.m. yesterday, a trooper from the College Park Barrack conducted a traffic stop for a speed violation on westbound Route 50 at Maryland Route 410 on a silver Nissan Altima in Cheverly. The motorist then moved to the left shoulder on westbound Route 50, where the trooper approached and advised her of the speed violation. While speaking to the driver, the trooper observed two men in the rear passenger seats without their seatbelts buckled. The driver and the three occupants were subsequently asked for their identification. One of the rear seat passengers, later identified as Wilson provided his driver’s license along with the driver and the front seat passenger. Thomas, the other rear seat passenger said he did not have his license and provided the trooper his alleged name, later found to be false. The trooper asked Thomas to exit the vehicle and then escorted him to his marked patrol car on the scene to verify his identity. Moments later, Thomas pushed the trooper and jumped over the jersey wall, and ran through traffic across Route 50 to the eastbound side. A subsequent foot pursuit ensued before Thomas was shortly apprehended without incident near the tree line of Route 50. Thomas was found carrying a loaded 9mm Ruger LC9s, which was reported stolen through Virginia. Further investigation at the scene indicated Thomas was also wanted by the Prince George’s County Police Department. Witnesses near the scene advised police that the other passenger in the vehicle, identified as Wilson, had thrown a handgun across Route 50 into the brush. Police conducted a search of the area and found a loaded Glock 42 handgun. Both Thomas and Wilson were arrested on scene. They were transported to the College Park Barrack for processing and later to the Department of Corrections in Hyattsville where they await an appearance before the court commissioner.